Royal Jordanian will never be comparable to Emirates, Etihad or Qatar Airways. The carrier has accepted that fact but only recently started to act strategically. This move has partially been driven by outside factors, such as the European economic crisis weakening the carrier’s once core European network, and regional unrest that has decreased North American traffic to the Middle East. Now Royal Jordanian is looking to grow around the Middle East and North Africa. In Jul-2013 it started its first routes in recent memory to sub-Saharan Africa, opening Accra and Lagos. Royal Jordanian has benefitted from a lack of European LCC presence in Jordan, despite an open skies agreement, and its North American position may be sustainable in the medium term as Emirates, Etihad and Qatar are still either ramping up their services or face traffic restrictions. All three carriers are tangoing with Royal Jordanian’s anchor North American partner, American Airlines. In time, further soul searching will be in order. The stronger and ongoing drops in European arrivals to Jordan contrasts the year-long drop that was seen by Canada and the US. The drop in demand has shaped Royal Jordanian's sharper and ongoing capacity cuts to Europe (and vice versa as capacity cuts cause a decrease in visitor arrivals). The earliest statistics available this year are for the three months to 31-Mar-2013. They portray a mixed start to the year with US arrivals up 0.3%, Canada down 5% and France down 23%. But Spain is up 6% while Germany is up 144.5%, UK 10% and Italy 49%. But in the case of Germany, the UK and Italy, growth is driven by same day, not overnight, visitors. 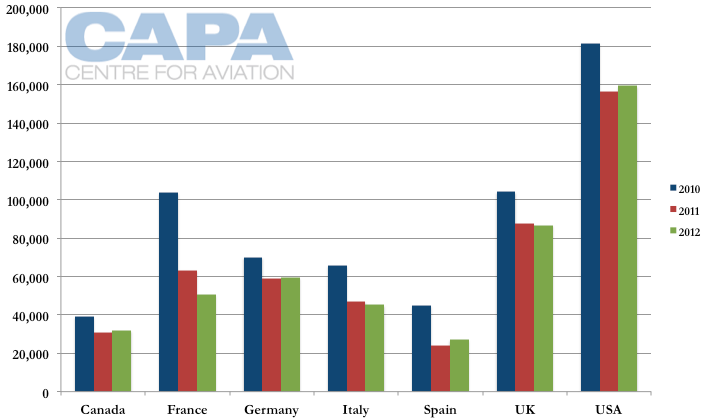 Looking only at overnight visitors (although this does not fully consider if they arrived via air and are a market for Royal Jordanian), Spain is up 4%, Germany 50%, Italy 16% and UK down 5%. Only Germany so far shows potential for 2013 numbers to rebound from 2010; all other markets will likely still be below 2010 levels. Royal Jordanian’s large picture five-year strategy (details are few), as announced earlier in 2013, is to grow non-passenger and cargo revenue, such as through ground handling and MRO offered to other carriers. But when looking at capacity growth, the carrier has and likely will continue to focus on regional markets. This represents a shift for the carrier as until recently over half of ASKs were deployed to North America and Europe. Now that figure is at 47%, although there is considerable long-haul Asian traffic, albeit with a different yield profile. Royal Jordanian is the dominant carrier at Amman, where it moved to a new and modern terminal complex in mid-2013. At Amman, Royal Jordanian accounts for 60% of frequencies, 56% of seats and 65% of ASKs. Middle East capacity in 2013 is almost twice the size it was in 2007. Its share of overall capacity has increased from 18% to 21%. North Africa is small but has doubled in size and has increased from 5% of capacity to 7%. Royal Jordanian in Jul-2013 launched a twice-weekly service to Lagos and Accra. Accra is operated as a tag from Lagos but Royal Jordanian does not have local pick-up rights. In addition to business and medical tourism, market targets include Muslim pilgrims journeying to holy sites in Saudi Arabia as well as some Christian pilgrims visiting religious sites in Jordan. The carrier expects popular connecting destinations to be Beirut, Delhi, Dubai and Saudi Arabia’s Jeddah and Madina. Of the Middle Eastern carriers, Emirates in Aug-2013 has a daily 777-300ER Dubai-Accra service while MEA has six times weekly A330-200 flights, two non-stop from Lebanon and four via other points in West Africa. At Lagos Emirates has two daily 777-300ER flights to Dubai, Etihad a daily A330-200 to Abu Dhabi, MEA six times weekly A330-200 flights to Beirut and Qatar Airways a daily A330-200 to Doha. Asia was a relative blip to Royal Jordanian in 2007. Capacity there was 36% of European capacity. In 2013 it is 72% the size of Europe and 16% of system capacity. Royal Jordanian’s Asian network is served via Bangkok where daily A330 flights continue to either Hong Kong (four times weekly) or Kuala Lumpur (three times weekly). Loads can be high to Bangkok given increasing demand from the Middle East and Europe, although traffic is heavily leisure. But the tag services to Hong Kong and Kuala Lumpur see mixed performance. Some Hong Kong-Bangkok services can be full if a Chinese tour agency takes up seats for the large China-Bangkok market that is carried via Hong Kong, but this too is relatively low yielding. Other services can be almost empty, and all are impacted by limited frequency and a 23:00 arrival time into Bangkok. 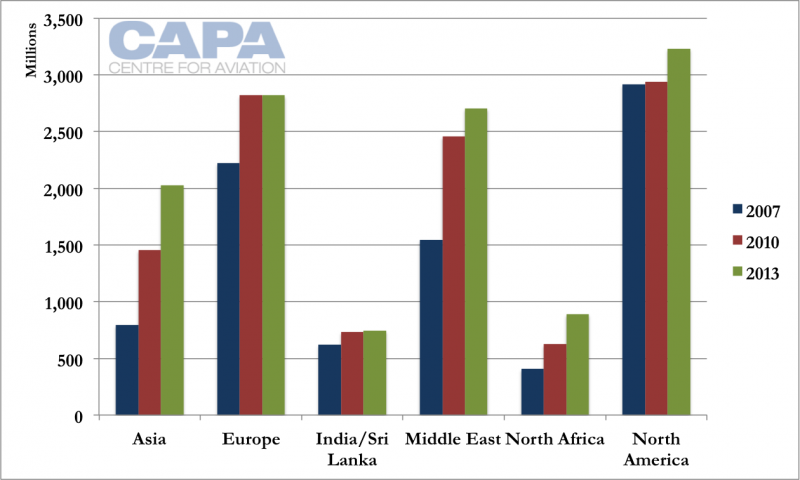 This means there is a gap between Royal Jordanian’s capacity growth and revenue growth in Asia. In 2007 all of Royal Jordanian’s Asian capacity was on non-stop services to Bangkok. In 2013 non-stop capacity has doubled but accounts for only 82% of Asian capacity given the Hong Kong and Kuala Lumpur tags. How much longer can Europe be sustainable? Royal Jordanian should consider itself lucky that despite a EU-Jordan open skies agreement, Jordan has yet to see a European LCC influx. In fact, its only LCC competition is a thrice-weekly easyJet service from London Gatwick. But Royal Jordanian should also know the clock is ticking. Royal Air Maroc did not fare well after a EU-Morocco open skies agreement, and while there are differences in the two markets, there are enough similarities to make them a worthwhile comparison. The Middle East network carriers in Royal Jordanian’s (distant) backyard increasingly pose a threat. For Europe-Jordan traffic, Royal Jordanian holds a distance advantage because a routing via Gulf hubs can be twice as long depending on the European destination. However, this does not limit pricing; Emirates is one of the cheapest options between London and Amman for sample Oct-2013 travel dates. London is Royal Jordanian's only European destination to see daily service. Even at its most frequent European point, Emirates, Etihad and Qatar have multiple flights a day, not just offering greater options but the possibility of a cheaper seat. 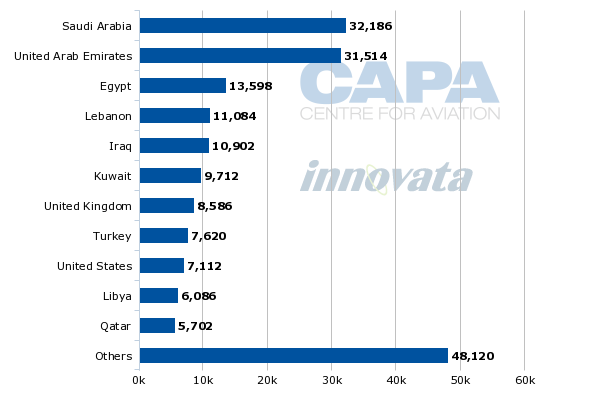 As noted there is high circuitry to fly from Europe to Amman via Abu Dhabi, Doha or Dubai, but this is less significant for most regional connections. Even at the peak of the 2013 European summer, Royal Jordanian downgraded its London Heathrow service from an A330 to A321, and even then it had weak load factors. But London is a bit of an anomaly as Royal Jordanian is not helped by a mid-afternoon London arrival slot and a return to Amman that gets in after midnight. Connections on both sides are limited; London is one of Royal Jordanian's last European services to leave Amman. The return arrival into Amman past midnight facilitates some regional connections but often with very early morning (pre-05:00) arrival times at the destination. Royal Jordanian’s European network has undergone pruning as the market declines. Rome, Vienna, Zurich, Geneva and Amsterdam saw frequency cuts by early 2012 while Brussels was cut completely. 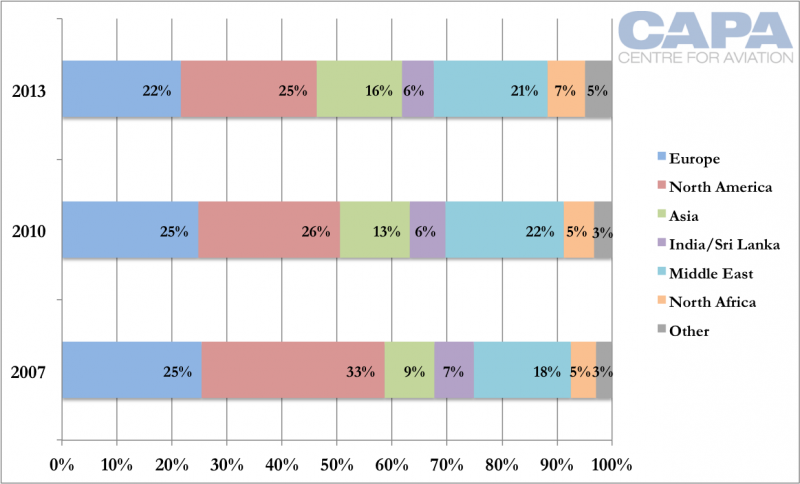 North America is less competitive than Europe among the Middle East network carriers but this is changing as they grow in the US and Canada’s bilateral regime is protectionist, highly limiting the presence of Middle East network carriers. While this could be to Royal Jordanian’s advantage, its position in Canada is not the strongest as it serves Montreal instead of Canada’s main eastern gateway of Toronto. Northern winter services are combined with a tag to Detroit; in northern summer the two operate as non-stop services. Royal Jordanian’s North American network will receive an efficiency boost in 2014 when 787s replace A340-300s. The carrier expects to receive the first of 11 787s in 3Q2014. 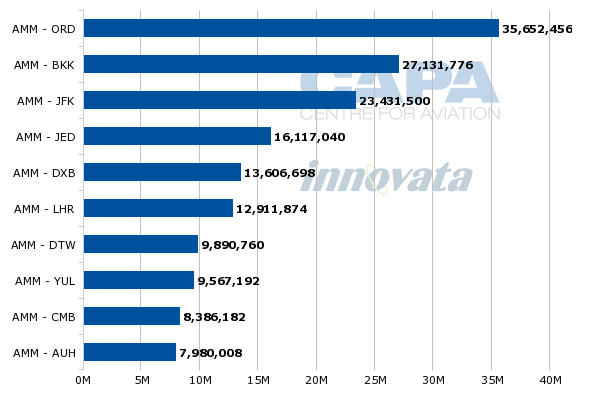 Only seven of those 787s are on direct order with Boeing. Elsewhere in the US, Royal Jordanian serves Chicago and New York JFK, both key markets but also hubs for oneworld partner American Airlines. Royal Jordanian codeshares with American to 18 North American destinations from New York and 50 from Chicago, according to the carrier, and to US markets from mutual European points. Royal Jordanian also codeshares with US Airways to Las Vegas and Phoenix (this relationship pre-dates American’s announced merger with US Airways). The larger connections at Chicago help explain why Royal Jordanian serves the city with a daily flight while New York sees five weekly service and Detroit twice weekly. In comparison Emirates in Aug-2013 has a double daily A380 flight to New York. Etihad and Qatar are both daily to New York JFK with 777-300ER. Royal Jordanian needs beyond gateway access in the US more than it needs American Airlines to feed it traffic – although it is a tidy contribution. But soon Royal Jordanian will likely find itself at the bottom as American weaves through its relationships in the Middle East. American has already started a wide codeshare agreement with Qatar Airways, which is due to join the oneworld alliance later in 2013. American also partners with Etihad Airways while Emirates is trying to woo American. The three can bring American far greater benefits than Royal Jordanian can, with the exception of the small US-Jordan market and some convenient connections. British Airways, which is sponsoring Qatar’s entry into oneworld, will very likely have significant cooperation and strategic alignment, some of which will be to the detriment of Royal Jordanian. However, Royal Jordanian's smaller size means it could not help BA realise most opportunities. So while Royal Jordanian will remain in oneworld, the carrier will have even more of a one-way relationship than it already has. It will need to work harder to gain synergies and find a place for itself in the new order. The situation – not quite an identity crisis – is not unique to Royal Jordanian. There are a number of smaller Middle Eastern carriers trying to identify a niche in an increasingly competitive market. Gulf Air has already shrunk its operation, although this was less by choice than sheer necessity as profits fell and the political climate in Bahrain deteriorated. 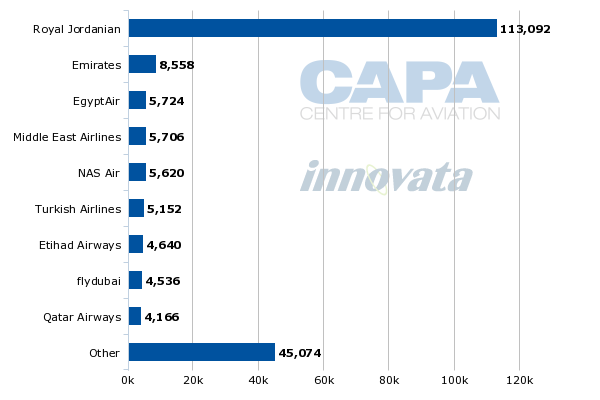 Oman Air has notable widebody capacity for a leisure-driven market, and the carrier is still trying to find its place. While it is adding additional widebodies, it is taking the view it needs partners rather than organic growth to reach North America, bringing in some rationality. Lebanon’s MEA has always been less ambitious, bringing some advantages in a downturn. But these situations are still far from ideal. Royal Jordanian’s return to operational profitability in 2012 was by the narrowest of margins: 0.14%. As the market becomes tougher, Royal Jordanian and its partial government owners will need to decide if the carrier should be big or concede some territory to be smart. Looking to grow non-passenger and cargo revenue is sound, but does not address the existing shaky network.